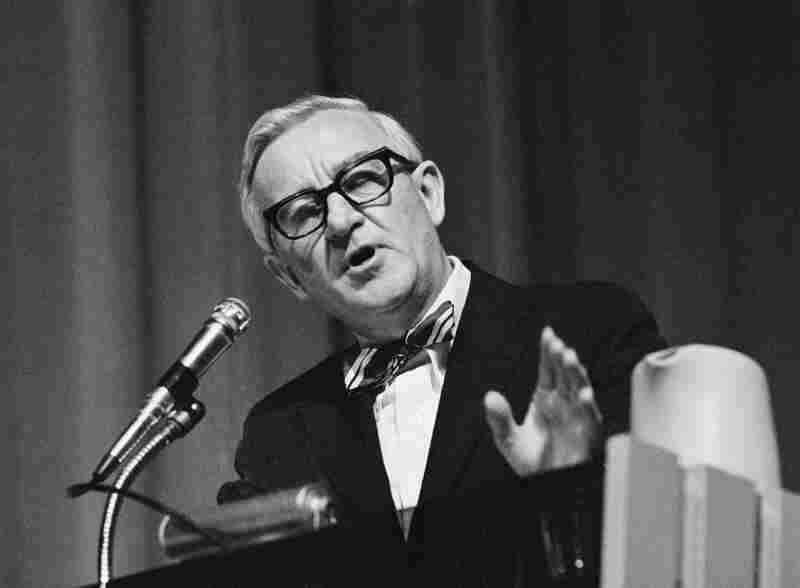 For Decades, Stevens Molded Supreme Court Decisions During his 34 years on the Supreme Court, Justice John Paul Stevens became a brilliant tactician, forging unexpected majorities that established new legal rules on issues ranging from the death penalty to national security. Although the retiring justice dislikes the description, he is considered the leader of the court's liberal faction. 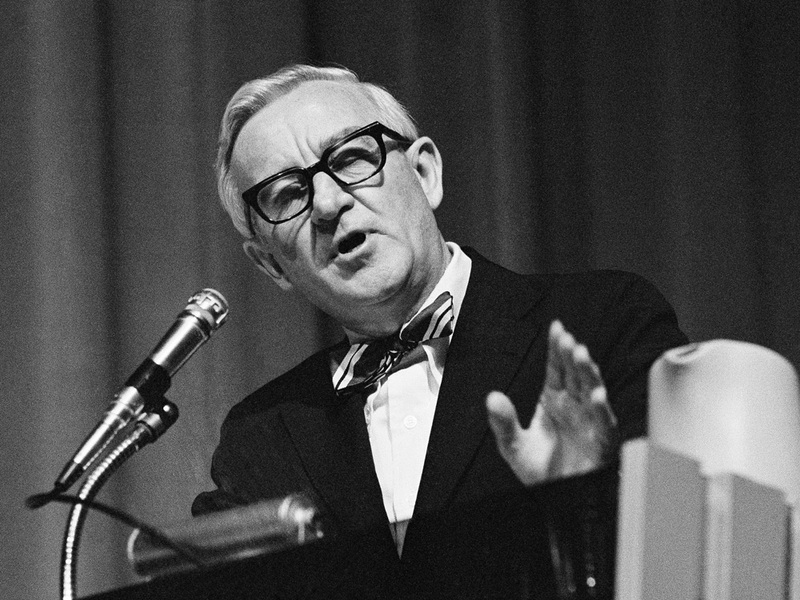 In his 34 years on the bench, Justice John Paul Stevens was known as a maverick and a liberal. John Paul Stevens, Associate Justice, Supreme Court of the United States, spoke to judges and lawyers at the American Bar Association's national convention Tuesday, August 14, 1979 in Dallas, Texas. The Justices were participating in a panel discussion of government and the courts. Federal Circuit Judge John Paul Stevens waits to testify during his Supreme Court confirmation hearing before the Senate Judiciary Committee on Dec. 8, 1975. 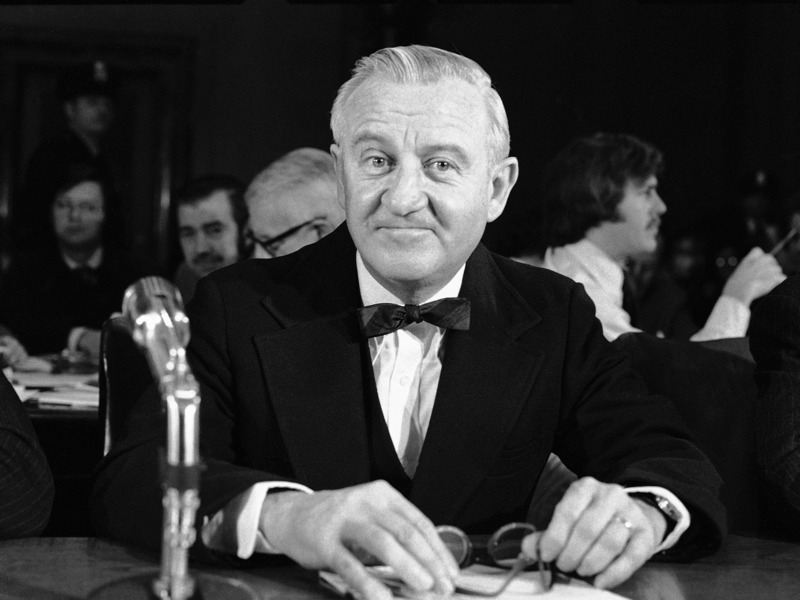 Justice John Paul Stevens, who announced Friday that he will step down from the Supreme Court when the justices break for the summer, started out his time on the nation's mightiest bench as something of a maverick. But during his 34 years of service, which ranks him among the longest-serving justices in U.S. history, Stevens became a brilliant tactician, forging unexpected majorities that established new legal rules on issues ranging from the death penalty to national security. Appointed to the court by President Gerald Ford, he became the leader of the court's liberal wing when the court's composition changed and moved increasingly to the right. Today, with the court split 5-4 on many issues, Stevens — who is the current court's oldest member — is most often in the minority, so the nomination of another liberal in his place would not change the ideological makeup of the court. Often called "a judge's judge," Stevens was something of a throwback to a less rancorous era, when, as one writer put it, "law and politics were a noble pursuit, not a blood sport." The quintessential Midwesterner, Stevens was born in Chicago and educated at Northwestern and the University of Chicago. In the Windy City, he earned a reputation as a brilliant lawyer and, later, appeals court judge. 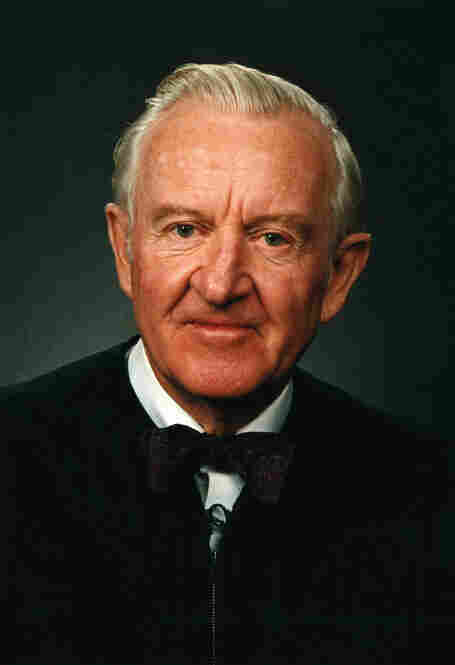 Justice John Paul Stevens, the Supreme Court's oldest member, is retiring. President Barack Obama now has his second high court opening to fill. Stevens speaks to judges and lawyers at the American Bar Association's national convention on August 14, 1979. The Justices were participating in a panel discussion of government and the courts. President Reagan poses with the nine members of the Supreme Court in the Blue Room of the White House, Oct. 1, 1982. 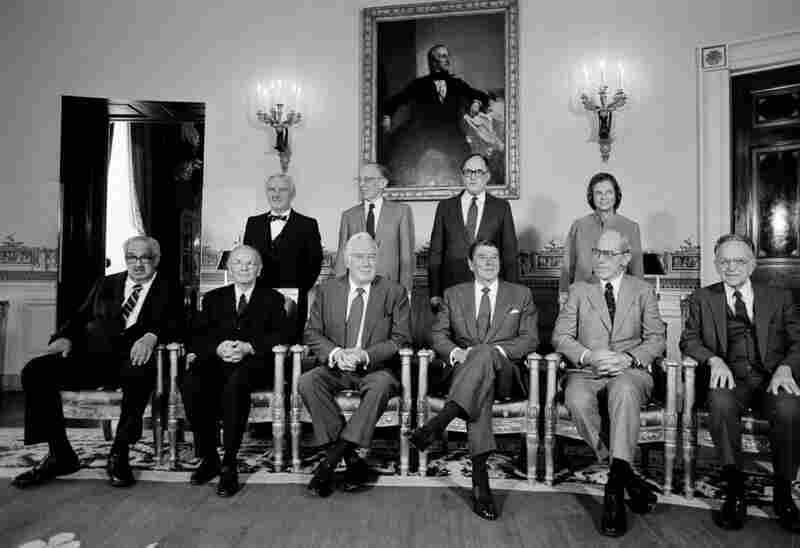 Back row from left: Justice Stevens; Justice Lewis Powell; Justice William Rehnquist; and Justice Sandra Day O'Connor, Reagan's sole appointment to the high court. Front row, left to right: Justice Thurgood Marshall; Justice William Brennan Jr.; Chief Justice Warren Burger; Reagan; Justice Byron White; and Justice Harry Blackmun. 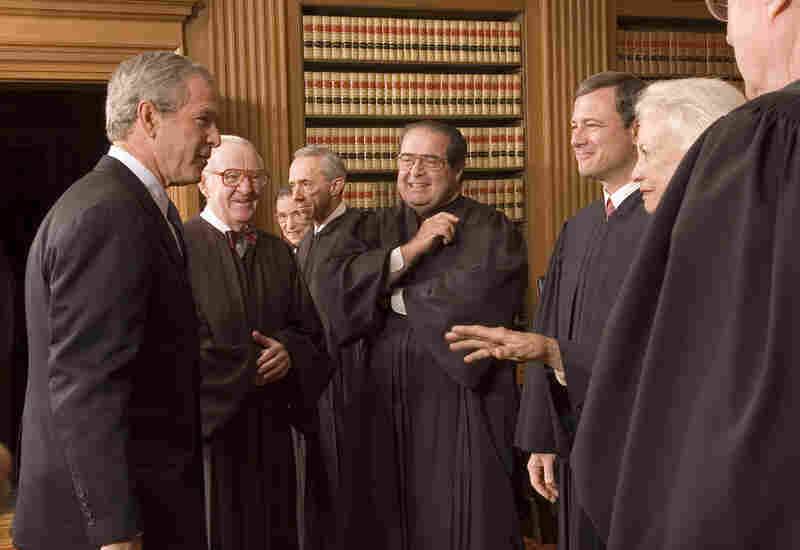 President Bush (left) enjoys a light moment with Supreme Court Justices (left to right), Stevens, Ruth Bader Ginsburg, David H. Souter, Antonin Scalia, Chief Justice John Roberts and Justice Sandra Day O'Connor in the Chief Justice Conference Room on October 3, 2005 in Washington, D.C. Roberts took his seat as the first new chief justice in almost 20 years, replacing William H. Rehnquist. In this Sept. 29, 2009 photo, the Supreme Court poses for a portrait. 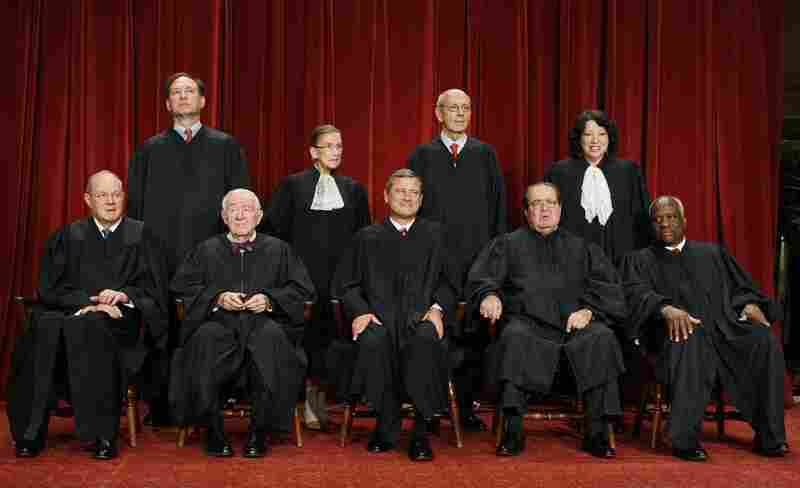 Seated, from left are: Justice Anthony M. Kennedy, Stevens, Chief Justice John G. Roberts, Justice Antonin Scalia and Justice Clarence Thomas. Standing, from left are: Justice Samuel Alito Jr., Justice Ruth Bader Ginsburg, Justice Stephen Breyer and Justice Sonia Sotomayor. 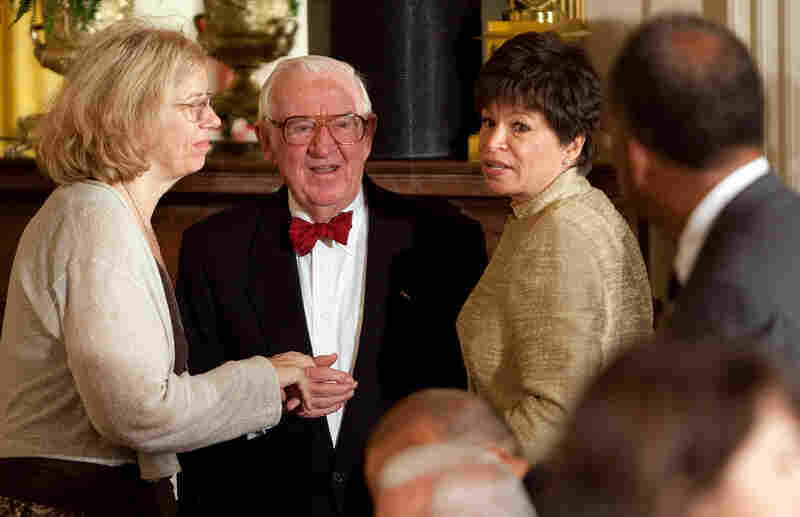 Stevens (center) talks with White House Senior Advisor Valerie Jarrett (right) during a reception for new Supreme Court Justice Sonia Sotomayor in the East Room of the White House August 12, 2009 in Washington, D.C. In 1975, Ford appointed him to the U.S. Supreme Court. The nomination drew instant praise from Democrats and Republicans alike, and Stevens was confirmed in a remarkable three weeks. Given Stevens' lack of political ties, his rise was to some extent a fluke, according to his onetime law clerk Clifford Sloan. "It was an accident of history," Sloan says. "The stars lined up in a way that could not have been possible before that precise moment and probably could not have been possible after that precise moment." A brand new president, Gerald Ford, suddenly had a Supreme Court vacancy to fill, and with the country still reeling from the Watergate scandal, the name of the game was to pick someone of unassailable credentials and no political connections. Although we may never know with complete certainty the identity of the winner of this year's presidential election, the identity of the loser is clear. It is the nation's confidence in the judge as impartial guardian of the rule of law. Ford assigned his attorney general, Edward Levi, a man also picked for his lack of political ties, to do the screening. And Levi, the onetime dean of the University of Chicago Law School, quickly fixed his eye on Stevens, a lifelong Republican, with no record of political or judicial activism. Once on the court, Stevens quickly earned a reputation for quality work and for independence. Unlike other justices, he even declined to attend State of the Union addresses. In his first decade, he was seen as a center-right justice, but as the composition of the court grew more and more conservative, he found himself referred to as the court's most liberal member, a moniker he has never liked, according to fellow Chicagoan Abner Mikva, who served 15 years as a federal judge himself. "It bothers him a great deal whenever he hears himself portrayed as a liberal," Mikva says. "When we're together, he looks at me playfully and says, 'Now, Ab, you know I'm not a liberal.' And I do." Over the years, Stevens authored some 400 majority opinions for the court on almost every issue imaginable, from property rights to immigration, from abortion to the death penalty, from school prayer to campaign finance, from term limits to the relationship between the federal and state governments. As former Solicitor General Ted Olson put it, "the crafty and genial hand of Justice Stevens was everywhere evident." The decisions Stevens is likely to be remembered for most, though, are those he authored on national security and presidential power. Stevens wrote the court's 5-3 decision repudiating President Bush's assertion of unilateral executive power in setting up war crimes tribunals at Guantanamo Bay, Cuba. And in 2004 he authorized the court's 6-3 decision allowing the Guantanamo detainees to challenge their detentions in the U.S. courts. Both had profound implications for the limits of presidential power. Bush was not the first president to feel Stevens' sting. Stevens also wrote the opinion for a unanimous court in Clinton v. Jones, the decision refusing to postpone Paula Jones' sexual harassment lawsuit against President Clinton. In summarizing the decision from the bench in 1997, Stevens dismissed the notion that the suit would burden the presidency. Born: April 20, 1920, in Chicago. Stevens' father, Ernest, built the Stevens Hotel, the largest hotel in the world at the time. Education: University of Chicago, A.B., 1941; Northwestern University School of Law, 1947. He served as editor-in-chief for the law review at Northwestern. Married: Elizabeth Sheeren, with whom he has four children; they divorced in 1979. Stevens married Maryann Simon in 1980. Military: Earned a Bronze Star while he was enlisted in the Navy during World War II. Early Career: After law school, Stevens clerked for Supreme Court Justice Wiley Rutledge and later worked at a Chicago law firm that specialized in antitrust cases. On The Bench: Appointed to the U.S. Court of Appeals for the 7th Circuit by President Nixon. In 1975, he was appointed to the Supreme Court by President Ford. Stevens was unanimously approved by the Senate. "In the entire history of the republic," he said, "only three sitting presidents have been subjected to suits for their private actions." And as for Clinton's case, "there's nothing in the record to identify any potential harm that might ensue from scheduling the trial promptly." As a former Stevens law clerk put it, "the justice just thought if the president had time to play golf, he had time to defend a lawsuit." Critics thought Stevens' view naive — the view of a man who knew nothing of the venality of politics or political enemies. And indeed, as it turned out, the Paula Jones case led directly to Clinton's impeachment. But defenders of the decision see it as an example of the highest value in the American legal system — that no person is above the law. Stevens authored some of the court's most complex and important decisions, often bringing together under one legal tent justices one might not expect to agree. But he also dissented from the court's rulings more frequently than any other justice. When the court struck down a Texas law that punished burning the American flag, Stevens, the Navy veteran and winner of the Bronze Star, objected. "A country's flag is a symbol of more than 'nationhood and national unity,' " Stevens wrote. "It also signifies the ideas that characterize the society that has chosen that emblem, as well as the special history that has animated the growth and power of those ideas." When the court revived the doctrine of states' rights, he dissented. In 1997, he took the unusual step of announcing his dissent from the bench when the court struck down a key section of the Brady gun control law that imposed a short waiting period on gun buyers to allow local law enforcement officials to run a criminal records check. "The basic question is whether Congress, acting on behalf of the people of the entire nation, has the power to require local law enforcement officers to perform certain duties," he said. "Since the ultimate issue is one of power, we have to consider its implications in times of national emergency," as well as the ramifications of preventing national action on matters such as the need for mass inoculation to forestall an epidemic or the threat of terrorism. Stevens' ultimate revenge came eight years later, when he managed to eke out a 5-4 majority upholding a federal regulatory scheme under which the federal law making marijuana illegal trumped state laws legalizing it for medical purposes. "Our case law firmly establishes that Congress has the power to regulate purely local activities when necessary to implement a comprehensive national regulatory program," he said. The rule announced today, that Congress must treat corporations like human speakers in the political realm, represents a radical change in the law. The court's decision is at war with the views of generations of Americans. This year, though, Stevens' victories were few, as the court grew more and more conservative. In January, when a five-justice majority struck down a 100-year-old ban on corporate spending in candidate elections, Stevens blasted the conservative majority in a 90-page dissent. "The rule announced today, that Congress must treat corporations like human speakers in the political realm, represents a radical change in the law," he said in a dissent from the bench. "The court's decision is at war with the views of generations of Americans." It was a dissent as angry as the one he wrote in Bush v. Gore. "Although we may never know with complete certainty the identity of the winner of this year's presidential election," he wrote in 2000, "the identity of the loser is clear. It is the nation's confidence in the judge as impartial guardian of the rule of law." Sloan, the onetime law clerk, sees the Bush v. Gore and Clinton v. Jones opinions as flip sides of the same coin. "He has a very deep respect for the crucible of litigation," says Sloan. "And in both cases, what he was strongly objecting to was the suggestion that there be some kind of arbitrary shortcut." In the Clinton case, the shortcut would have been to delay a trial, and the court unanimously rejected that. In Bush v. Gore, the shortcut was to remove the case from the Florida state courts, where vote-count cases are traditionally resolved, and Stevens bitterly objected. Stevens' frequent dissents, as well as the separate opinions he often filed to note that his views differed from fellow justices, earned him a reputation as a maverick. But as he explained recently, his insistence on stating his views stemmed directly from his experience as, in effect, a special prosecutor more than 30 years ago, when he was appointed to investigate charges of misconduct against two sitting Illinois Supreme Court justices. What Stevens found was that the court opinion that had been improperly influenced was not, as the public record indicated, unanimous. Two justices had in fact dissented, but in the name of collegiality had not publicly noted their dissents. It's because of this incident, Stevens said, that when he became a justice on the U.S. Supreme Court, he did not "go along" with colleagues in some cases. The fact that a justice disagrees with his colleagues is a matter of sufficient importance that the public is entitled to know, Stevens said. The judicial scandal investigation influenced Stevens in other ways. The man who made the initial charges against the two state Supreme Court justices was well known in Chicago as a less than reliable gadfly. And yet, on the cover of Kenneth Manaster's book about the probe, there is a picture of the gadfly, Sherman Skolnick, in his wheelchair, with Stevens at his side. "Stevens is standing with his head bowed, listening very carefully to what this fellow, who many consider to be a kook, has to say," Manaster says. "And I really love that picture, because it says to me that this is a man who wants to hear even a person who by that time was known to have close to zero credibility, but you never know. And this was an instance in which Skolnick got it right." It is for that reason that Stevens refused to join his Supreme Court colleagues in imposing penalties on people who repeatedly file frivolous appeals with the U.S. Supreme Court — because you never know; sometime, someone might have a legitimate complaint. In that way and so many others, Stevens for decades marched to the tune of his own drummer. The question now is what tune his replacement will march to. Whomever the president chooses, it is doubtful that he or she will wield the kind of influence that Stevens did. At least not for some time. During his more than three decades on the court, Stevens became increasingly skilled at molding opinion to reach the magic number of five majority justices. One of his least-known efforts involved the machine that became ubiquitous in American homes: the TV video recorder. In the early 1980s, Hollywood tried to ban the devices and punish both the manufacturer and the home user with fines for copyright infringement. A majority of the court initially agreed with the filmmakers, but Stevens' proposed dissent turned the court around, and he ended up writing the court's 5-4 opinion declaring that VCRs did not violate copyright laws when used in the home to make a single copy for personal use. A decade later, Stevens would play a similarly pivotal role in the court's reconsideration of its abortion ruling, Roe v. Wade. With the court closely divided, three justices — Sandra Day O'Connor (now retired), Anthony Kennedy and David Souter (also now retired) — circulated an opinion upholding what they called the core of Roe but making it easier for states to regulate abortions. The opinion split the court into three separate factions: four justices to reverse Roe, three to uphold its core and two to uphold it entirely. Stevens and Justice Harry Blackmun were the two. But upon receiving the draft of the three middle-ground justices, Stevens suggested a reorganization of their opinion so that he and Blackmun could join most of it and there would be a single opinion that was supported by a court majority. O'Connor, Kennedy and Souter quickly agreed, and the opinion became the law of the land. These are just two examples of how Stevens, with the power of his intellect and the firm, respectful approach he took toward colleagues, moved the court in his direction. Putting together such victories became increasingly difficult after O'Connor's retirement, when the court moved dramatically to the right. But Stevens continued to score the occasional unexpected win — using his knowledge of the law, his powers of persuasion and logic and the wisdom of a man who will turn 90 on April 20.